One minute of idling a vehicle produces as much carbon monoxide as smoke from three packs of cigarettes. That's disgusting! Idling just 5-10 minutes a day can add up to 1-2 tanks of fuel and $35-115 wasted each year going nowhere. But the good news is that we can improve our air quality, avoid wasting fuel, and save money by making a commitment to reduce unnecessary idling when safe, like not in traffic. 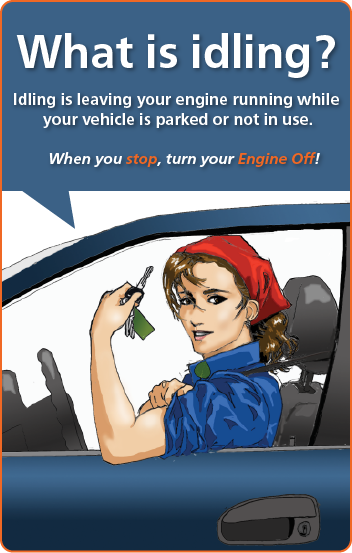 While your vehicle is idling during short stops for red lights and stop signs, this is not a safe opportunity to turn your engine off to protect air quality. The Colorado State Patrol and Engines OFF! Colorado discourage drivers from turning their engines off on active roadways because you cannot predict how quickly you will have to move again. But, you can safely avoid unnecessary idling in common situations, like warming up vehicles in the winter and waiting to pick up passengers. Click HERE for sample pledge forms to never idle when picking up your child at school. Avoid idling in drive-thru lines at fast food restaurants and banks by parking and going into the business. If you do the drive-thru and it looks like the wait is long, turn your engine off until you need to move forward. At the very least, turn your engine off when you get to the window. The attendant will appreciate it. If you are flying to another city, share an airport shuttle with other travelers rather than renting a personal vehicle or taking a taxi to and from the airports on both ends of your travel. If you are buying a new vehicle or renting one for travel, consider a hybrid electric vehicle. Most hybrid vehicles use idle-stop technology which switches power from the gasoline-burning engine to the batteries, automatically saving fuel by preventing the vehicle from idling. If you drive to an event, try to avoid arriving or leaving the venue during the major rush times to prevent unnecessary idling and wasting of fuel in line to enter or exit the parking areas. Work with your elected officials to adopt an idling ordinance. For example, the City and County of Denver's Idling Vehicle Ordinance limits idling to five minutes in any one-hour period. Denver Police have the authority to ticket any vehicle immediately if it is left idling unattended, unless the vehicle has a remote starter.